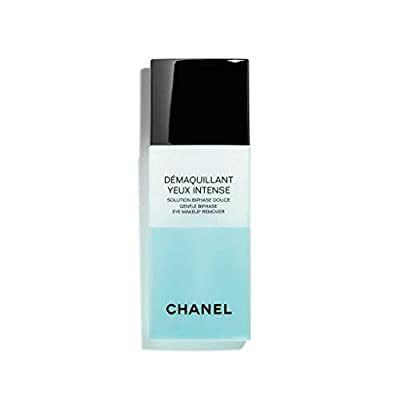 Demaquillant Yeux Intense Gentle Bi-phase Eye Makeup Remover 100 Ml. Product prices and availability are accurate as of 2019-04-20 00:05:24 UTC and are subject to change. Any price and availability information displayed on http://www.amazon.com/ at the time of purchase will apply to the purchase of this product. GENTLE BI-PHASE EYE MAKEUP REMOVER : An eye makeup remover which is both effective and gentle for an eye contour perfectly cleansed and protected lashes. It has a two-phase formula: a soothing water phase and a highly purified lipidic phase that removes makeup with no oily film. The eye contour and lashes are perfectly makeup-free. Leaves the eyelids soft and supple and has a protective action on lashes. Ophthalmologist tested. pH balanced to tears. Suitable for sensitive eyes and contact lens wearers. Fragrance-free. How to use : Shake the bottle well before use so that the two phases blend into a homogenous, exceptionally effective solution. Sweep a cotton pad moistened with DÉMAQUILLANT YEUX INTENSE over eyelids to remove makeup. Repeat from the roots to tips of lashes. If necessary, leave the moistened cotton pad on the lashes for a few seconds. Can also be used to remove lip makeup. In terms of item color, it may be slightly different from each monitor display and specification.